Experience this amazing safari where you will go around the best spots in Kenya. Have an early morning game drive and look for amazing bird species all in the comfort of a safari vehicle well designed with a large pop-up roof for the best view and photography of wild animals. Take a nature walk and embark on an evening game drive that will give you an experience you will never forget. On this safari, you will stay at several camps in Maasai Mara National Reserve and Samburu National Reserve. You will also be accommodated at a budget hotel while you are in Lake Nakuru and Lake Naivasha. All this can be customized to fit your comfort at any given time. You will be picked up from your hotel at 7:30 a.m. and you will depart for the dramatic semi-arid scrub land of the Northern Frontier. Arrival in Samburu Game Reserve will be by lunch time. After lunch, you will embark on a game drive to watch resident wildlife species like the Reticulated giraffe, Grevy’s zebra, Beisa oryx, and the blue-necked Somali ostrich that are rare elsewhere in the country. Dinner and overnight will be at a lodge or luxury tented camp. You will spend the whole day exploring the Samburu Game Reserve park. Dinner and overnight stay will be at a lodge or luxury camp. The highlights of Samburu Game Reserve is the spectacular scenic beauty, rivers, and forests. It is an area where the local people have a rich and colorful heritage. The reserves have numerous permanent springs and a wealth of wildlife which includes leopard, hippo, elephant, lion, reticulated giraffe, Grevy’s zebra, and crocodile in the Ewaso Nyiro River. Over 365 species of birds have been identified in the sanctuaries. After breakfast, you will depart for Lake Nakuru. Arrival will be in time for lunch at your lodge, located inside the Lake Nakuru National Park. In the afternoon, you will embark on a game drive where you will have the opportunity to spot leopards, rhino, and the famous pink flamingos, as well as a variety of other wildlife. Dinner and overnight at a lodge or luxury camp. Lake Nakuru’s claim to fame is anchored on its flamingos and the over 400 species of birds found there. The lake itself is a soda lake on the floor of the Rift Valley. The lake has also earned a reputation as an important haven for endangered species, particularly the Rothschild giraffe and the black and white rhino. Lions, water buck, buffalo, and baboons are all residents there. After breakfast, you will depart for Masai Mara Game Reserve, the land of vast migrating animals. Arrival will be in time for lunch. After lunch, you will embark on a game drive. Dinner and overnight at a lodge or a luxury camp. Spend the day in Masai Mara Game Reserve with early morning and evening game drive. You will explore one of the most famous and beautiful national parks in the world, you will have the opportunity to spot the big five with their associated predators which include the buffalo, rhino, hippopotamus, oribi, warthogs, Thomson’s gazelles, zebra, and hartebeest among many others. All meals and overnight at tours lodge or luxury tented camp or Ol Moran Lodge or Sopa Lodge. The Mara offers wildlife in such variety and abundance that it is difficult to believe: over 450 species of animals have been recorded there. You will easily see lions, rhinos, hippos, crocodiles, giraffe, wildebeests, zebras, buffalo, warthogs, hyenas, jackals, wild dogs, buffalo, leopard, many kinds of antelopes, and elephant. It is in the Mara that perhaps the most spectacular event of the natural world takes place. This is the annual migration of millions of wildebeest and zebra from the Serengeti, Tanzania in search of water and pasture. Following on their heels are the predators of the savanna, the lion, cheetah, wild dog, jackal, hyena, and vultures. 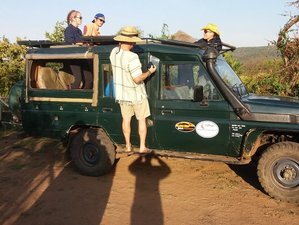 Morning tour safari game drives then you will return to the lodge for breakfast, you will depart the lodge and drive to Nairobi where the safari ends. This safari will take place in Samburu National Park, Lake Nakuru National Park, Lake Naivasha, and Maasai Mara National Reserve, Kenya. Daily breakfast, lunch, and dinner are included in the price. Vegetarian, vegan, gluten-free, and regular meals are served in the tour. If you have special dietary requirements it is a good idea to communicate it to the organizer when making a reservation. Please book your flight to arrive at Jomo Kenyatta International Airport (NBO) or Moi International Airport (MBA).